Where to Retire? Where to Vacation? Are the locations one in the same? They may have some similar characteristics, but let’s look at where you should spend those years of retirement. Retirement does not mean sedentary. You may be done with the hustle and bustle of a commute to work every day, a 9-5 commitment, and working night’s to catch up. But, many who retire look for a place their lifestyle can remain active with either a second, less demanding career, volunteer work, or activities they’ve put off for many years. They may have lived in suburbia or a large city for most of their lives and now want a location where they can experience a more simple life. Door County Wisconsin has been named one of the best retirement locations in the country by Where to Retire, a magazine designed to help people determine their retirement location. Scenic beauty and small town lifestyles were among the top reasons Door County received this designation. For similar reasons Next Generation Trust Company tabbed Door County as a great spot for retirement. Door County, where is it? Door County is the “thumb” of Wisconsin. Hold up your right hand, palm facing toward you, and there is Door County. 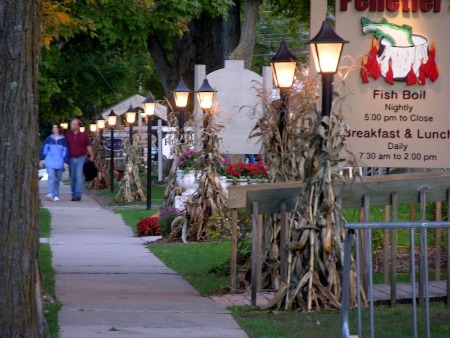 Charming little lake towns, colorful stretches of woods and meadow, outdoor activities, art galleries, wineries, lighthouses, golf courses, theatre companies…you name it, Door County has it. Green Bay’s Austin Straubel Airport is about an hour away, and Milwaukee’s Mitchell Airport about two and one-half hours away. If you choose to fly, your drive to the Door Peninsula will be a scenic one. If you live in one of the upper-midwestern states driving is likely your best option, with interstates and highways that meander the outline of the Great Lakes. People from all income brackets choose Door County as home. $100,000 to multi-million dollar homes and condominium homes are found throughout Door County. Rental properties on a long-term basis are often scarce and can come at a premium. Expect at least $500 per month in Sturgoen Bay and possibly more as you travel north. Gasoline prices are generally around the national average. Electric service is provided by either Wisconsin Public Service or Sturgeon Bay Utilities. Natural Gas lines run in Sturgeon Bay and areas just north and south of the city, otherwise people generally use forced air propane fueled furnaces. There are land telephone line services, but most individuals now are turning to cellular phones. The most likely carriers of phone service are Cellcom and AT&T. Internet service is available throughout the county too and there are various providers to choose from. As in any location, the cost of your utilities will depend on the number of people in your household and lifestyle. If you would like more information on utility costs, call me at 920-493-5472. Door County Medical Center is located in Sturgeon Bay, the county’s one hospital and nationally rated as very good. There are medical, dental and chiropractic clinics dotted throughout the county and Sturgeon Bay too. Each town has superb First Responder networks and volunteer fire departments, and the Door County Emergency Services department is second to none. You will find Door County folks among the friendliest and most welcoming around. So, check it out and you might just decide that the wooded wonderland surrounded by almost 300 miles of shore is the right place for you!